Carry a bottle of wine, a Bluetooth speaker, and so much more! Is the Bike Strap going to hold my thing? As long as your object weighs no more than a typical red brick and will fit between your pedals you're good to go. Irregularly shaped objects may have mixed results. Will it block the sound from my speaker? 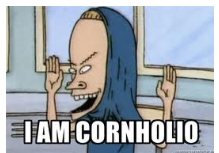 Try this: pull your t-shirt over your ears like you're the Great Cornholio and shove your earbuds into your ears. There's very little change in the audio quality. The Bike Strap works the same way. Is it compatible with my bike? Almost every bike sold is compatible with the Bike Strap! Some single speed bikes and most swoopy step-through bikes do not include water bottle cage braze-ons. If your bike does not have braze-ons you just need to install an adapter. Doesn't stuff pop out? The Bike Strap utilizes a custom made 3 inch wide velcro strap. It's probably the widest velcro strap you've ever seen. During literally thousands of miles of test riding and dropping countless flights of stairs, nothing has ever fallen out of a production Bike Strap. That being said, make sure you strap in tightly. How does it install? All you need is a 3mm alan wrench, a bike with water bottle cage braze-ons, and 2 minutes. Use the screws included with the Bike Strap. Tighten down the screws until the Bike Strap is secure. Avoid over tightening. When you're carrying an object strap it in tight. When you're not using the Bike Strap, wrap it around your frame tube. Are there any known issues? The 3D printed bracket is white plastic that has been painted black in the Shapeways factory. The black paint will wear off in some places with use. Will it annihilate my pants or tights? The hooks side of the velcro faces inward whether you're carrying something or not. This protects your fancy pants or distinctive stockings from the mean old velcro. What if my Bike Strap breaks? Is there a warranty? Modeo backs every Bike Strap with a 1 year warranty. If you manage to break your Bike Strap during normal use then we are happy to send a replacement. But please send us the broken one so we can fix the problem! Can I access stuff in the Bike Strap while I'm riding? Objects held by the Bike Strap are very secure. As a result, they are not accessible while you're riding. However, unlike competing products which require you to undo multiple buckles, our single strap design makes it fast and easy to access your coffee, water, or Nalgene while you're stopped at a light. What does it come with? You will receive the Bike Strap and a set of screws.